We offer a fresh alternative to major oil company brands. We are a regional market leader with a well-established, reputable brand and our existing sites exceed market averages for liquid volumes. We continually demonstrate the ability to grow our business through our dealer network with marketing programs that increase consumer awareness of the Irving brand and the quality products that we offer in the marketplace. We continue to build a fuel brand and network that our consumers and customers alike take pride in being associated with. 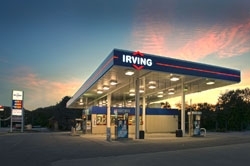 If you're a dealer interested in offering Irving's clean fuels to your New England customers, please take a moment to fill out our contact form and an Irving representative will be in touch with you shortly!